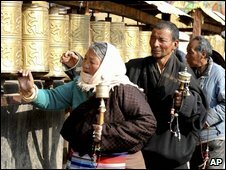 China says it is reopening Tibet to foreign tourists in early April. The region has recently been closed to travellers because of security fears linked to a number of sensitive anniversaries. The Chinese news agency Xinhua quoted Tibet's head of tourism as saying the region was now "harmonious and safe". But there is still a heavy Chinese military presence in the area, and foreign journalists and human rights groups cannot operate freely. China claims Tibet as part of its territory, but many Tibetans dispute this. Even at the best of times, foreigners needed special permission to visit Tibet, according to the BBC's correspondent in Beijing, Quentin Somerville. But getting there has been even more difficult since last year's violent protests against Chinese rule. Analysts say that the main reason for the recent closure was the 50th anniversary of the uprising that led to the Dalai Lama, Tibet's spiritual leader, fleeing over the border to India. But now the anniversary is over, the authorities say that visitors can return from 5 April. "Travel agencies, tourist resorts and hotels are well prepared for tourists," Tibet's head of tourism, Bachug, told Xinhua. Like many Tibetans the director goes by only one name. The closure has dealt a huge blow to Tibet's tourism industry, with visitor numbers down by nearly half in the first nine months of last year, according to Xinhua. The clampdown was the second time that Tibet has been sealed to foreign tourists recently. 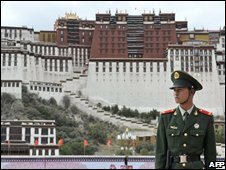 The government banned travellers from going to the area in the immediate aftermath of the riots which erupted in Lhasa in March 2008, on the 49th anniversary of the Tibetan uprising. The launch of the first luxury train service from Beijing to Tibet has reportedly been postponed from April until next spring.